Manufactured continuously from between 1982 and 1994, the C64 sold in the region of 17 million units worldwide. That is a hell of a lot of machines, especially when you consider that the retail price back then was around the $600 mark - that's about $1300 in today's money - more than twice the price of your average iDevice. The chances are that if you grew up in the 1980's either you, your older siblings, your parents or family friends had one - normally under the pretence that it was for helping with home or office work (thanks to the amazing GEOS suite). This is the machine that kickstarted the demo and cracking scenes, creating a generation of bedroom-coders (who said indie-gaming was a modern phenomenon?) some of whom later formed some of the biggest games developers and publishers of the 1990's. As a result, for many the C64 epitomises retro computing and the 8-bit machine remains a popular hobbyist device even now, 30 years later, with new releases coming out on a daily basis via the CSDB (Commodore Scene Database). In addition to this, the availability of new peripherals offering USB and SD card support (and even ethernet connections) have helped to make the machine far easier to use in the 21st century. Anyway, I digress. 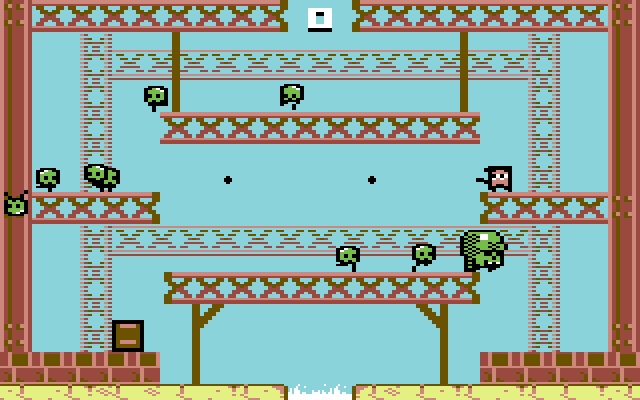 Back in 2011, prior to the announcement of his Canabalt conversion (C64anabalt), Paul Koller messaged me via the CSDB internal mail system to advise that his entry for our 16KB C64 Game Dev Competition would be "a conversion of one of the best indie-games of recent years". Super Crate Box immediately came to mind, being very much still on everyone's radar, and although I was later proved to have guessed wrongly, Paul and I continued to discuss the possibility of a SCB conversion further. With its simple design reminiscent of classics like Bubble Bobble, it would require some careful planning to pull off but seemed very feasible. The seed was planted. 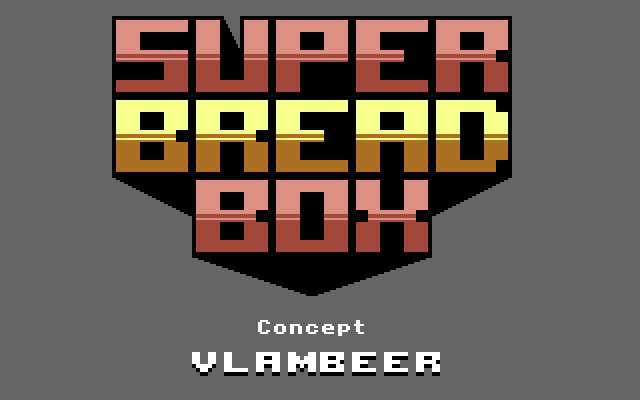 Zooming forward to earlier this year, Paul mailed me early after the announcement of the 2012 competition to advise that he was actively working on a SCB port, but he was having trouble contacting Vlambeer to obtain permission. A few messages via facebook and twitter and it was all sorted, with Rami particularly interested in seeing what his fellow Dutchman could achieve via 6502 assembly on the modest 64KB, 1Mhz hardware within the additional competition limitations of a tiny 16KB filesize. Originally just called Super Crate Box, one day a new build popped into my inbox entitled Super Bread Box as a joke (the classic original model C64 is lovingly referred to as a 'bread bin' by enthusiasts due to its completely unergonomic shape). The name resulted in a few laughs here at RGCD and Vlambeer, so the name kind of stuck. How was Super Crate Box Converted to the C64? Although it looks simple by today's standards, Super Crate Box is actually a pretty complex game with a lot happening on screen. 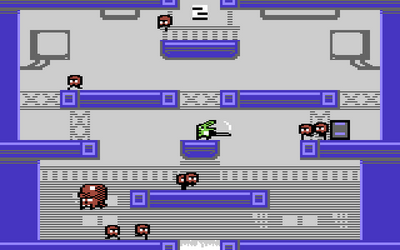 By default the C64 only allows for eight sprites on screen at a time - so Paul had to program an efficient multiplexer in low-level assembly language to trick the computer into permitting up to eight sprites per horizontal scanline. Then there were the bullets and explosions to consider. Thankfully the C64 has a processor-light character graphics mode, so all the bullets were rendered as 8x8 pixel 1-bit characters that overwrite the background graphics - but the huge bazooka, grenade and mine explosions were still problematic, causing considerable slowdown whenever used... However, this soon evolved from being a problem to a 'feature' when it transpired that the playtesters actually liked the NES-style breathing space that the slowdown offered in this otherwise insanely-paced game. Then there was the music. 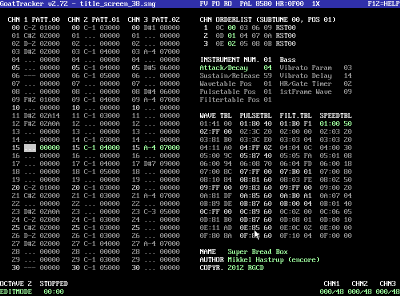 Having worked together on C64anabalt (as well as with Endurion and Smila on Soulless), Encore (Mikkel Hastrup) was the logical choice for the project, and within a matter of weeks he had remade all the music and sound effects in Goattracker for playback via the C64 SID chip - all squeezed into around 4KB of space. Compare this to the bulky MP3's of the original game and you should be able to appreciate that this is no trivial task - like assembly programming, sequencing real chip music is a skill that is sadly becoming something of a lost artform (at least outside the limits of the demoscene). So how does the C64 version of the game compare to the original? When will it come out? What media formats will it be released on? What will it cost? Etc. Ok, well the gameplay video below (and exclusive Play Expo showcase if you were there) will have hopefully convinced you that a reasonable conversion is possible on the C64, but there's a lot missing from this preview that Paul is aiming to include in the final build. The aim is to release a cut-down 16KB version of the game for free at midnight on the 30th of November (the competition deadline) and then a fully-featured 64KB C64 conversion on retail cartridge in the first quarter of 2013. 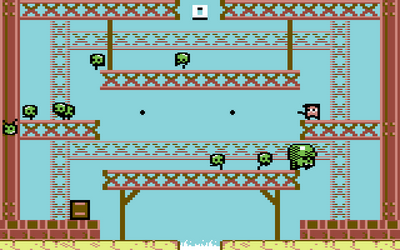 The 16KB version will be similar to the build shown in the video - only two characters, no flying skulls and all the weapons and levels unlocked from the outset. There is no game saving either. The retail version will be available on cartridge only, and cost in the region of £25-31 inclusive of packaging, shipping and fees (price depends on a variety of packaging options which are currently TBC). There will also be a free emulator version for download too. This 'full-fat' cartridge build will feature the tutorial level and weapon/level/character unlocking logic (a passcode will be generated against a player profile to record progress and also for use with a website to record C64 crates collected). There are also plans for adding all the original characters, the flying skulls plus some exclusive unlockable C64 level reskins. The game will also be NTSC compatible (hopefully), although with its shorter CPU time the game will most likely require an enemy or two to be cut on NTSC machines. Right now Paul is concentrating on the 16KB version for the competition, but there will be further announcements regarding the 64KB retail port near the end of the year. If you'd like to get in touch to discuss the game further, just drop us a line via the contact page. Absolutely brilliant! Yet again, Paul Koller satisfys our expectations. I'm pretty sure the original soundtrack was created in Famitracker (in VRC7 mode). 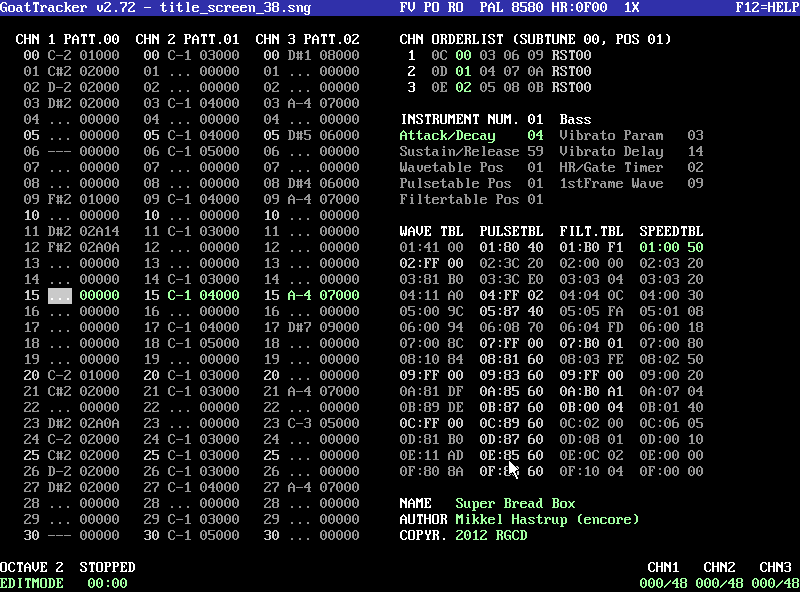 This means that not only the size of the source files are low but the soundtrack would actually be playable on Famicom hardware ("real chip music"). Yeah, they definitely used streamed audio for the game. Thanks for your response! When will the cartridge be available for purchase? ... or in more direct words "SHUT UP AND TAKE MY MONEY!!!"